Chicago's alfresco drinking scene is phenomenal, with seemingly endless choices for hotel rooftop lounges, terraces and sidewalk patios. But whatever the case, it doesn't get better than a beach bar, which are all located along Lake Michigan/Lake Shore Drive. During the annual Air & Water Show in August, those seated at the beach bars have front row seats of the action. Just like the beaches on which they are located, these waterside drinking destinations range from casual, laid-back bars to ultra-sceney destinations. Probably the clubbiest of Chicago's beach bars, Castaways is on North Avenue Beach and features live music, deejays and more on weekends. It's directly behind the volleyball courts, making it a popular hang after matches. Castaways is walking distance to Lincoln Park, Gold Coast, Streeterville and Old Town. What To Drink: Drinking options include exactly what one would expect: frozen margaritas and pina coladas, plus craft beers and a Mai Tai. Those with large groups (10-12 people) should maximize their fun by renting a cabana on weekends. That comes with bottle service, of course. The Ohio Street Beach bar offers a more reserved vibe than Castaways, with music ranging from reggae steel beats to Jimmy Buffett standards. Caffe Oliva is a great date spot before or after a swim, and there's a great mix of guests in swimwear and regular clothing. It's walking distance to Navy Pier. What To Drink: Imbibers will find great beach-drinking cocktails on the menu like island rum punch, a white rum mojito and mimosa. And for those watching their waistlines, "skinny" sippers are also on the menu: Think specialty margaritas, vodka and lemonade and a punch all under 135 calories. The team behind Caffè Oliva is also responsible for The Dock, which sits directly in front of Montrose Beach. It's further north of the touristy beach spots, but those looking for an authentic neighborhood experience will fare well here. There are live music performances and other events throughout summer. What To Drink: Guests may order wine by the glass or bottle, and there are plenty of original and classic cocktails to choose. There is also a "skinny" margarita. Consider Nacho Mama's a full-on beach bash. It's located at Osterman Beach a.k.a. "Hollywood Beach," and its festive setting is great for large groups and families. The popular neighborhood destination is in walking distance to Andersonville. What To Drink: There's a signature frozen margarita, plus vodka blackberry lemonade, Moscow Mule and Gin Rickey. There's also sangria, beer and wine on the menu. 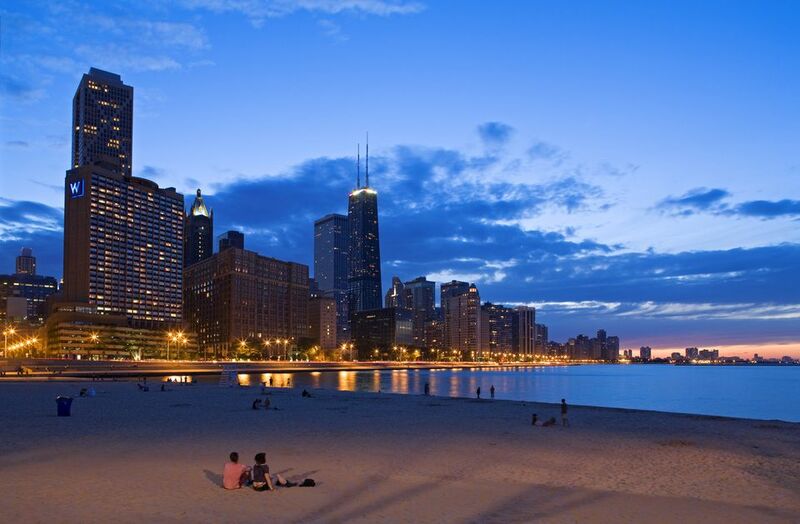 Walking distance to the Gold Coast, Magnificent Mile and other top visitor attractions, Oak Street Beach Food & Drink looks and feels like the sort of spot you'd find off the coast of Florida. The bar is perched slightly over the beach, so guests don't miss out on any action. There's an annual music festival happening over Fourth of July weekend. What To Drink: Folks come here to drink margaritas made with fresh lime juice, craft beers and boozy sweet tea made with vodka. Those looking for pet-friendly hotels will be thrilled to find a great drinking place to take their pooches. The Waterfront Café is just shy of Edgewater and Rogers Park in Berger Park. It's housed in a historic landmark coach house that's attached to one of the few remaining lakefront mansions. Waterfront Café is super casual, however, with a patio facing the beach. There's live music, ranging from bossa nova to classic jazz, on most evenings. What To Drink: Guests may order classic cocktails like the Manhattan, Mai Tai, Screwdriver or Dark & Stormy. There's also a well-curated list of local craft beers.